Solar photovoltaic (PV) cells use sunlight to produce energy. All solar PV cells are made of materials called semiconductors that absorb photons when sunlight strikes the PV cell. The absorbed photons then knock electrons loose within the PV cells, allowing them to flow, which produces a current. Solar PV cells contain one or more electric field(s) that force the direction of electron flow. Placing metal contacts on the top and bottom of a PV cell harnesses this current so it can power external appliances, such as a calculator or pool pump. 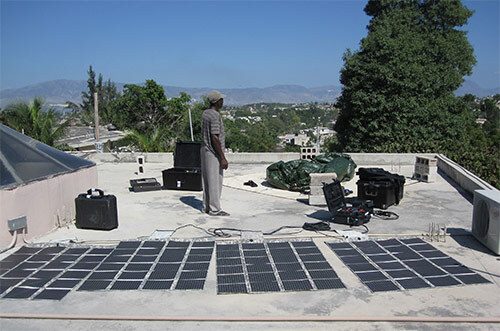 On their own, solar PV cells produce a limited amount of energy, but when arranged and electrically connected and mounted on a supporting structure, the result is a solar PV panel that combines the electrical output of each solar PV cell, yielding a greater amount of energy production. The power, or wattage, that a solar cell or a panel of cells can produce is determined by measuring its current and voltage. Sometimes terms like “solar panel”, “photovoltaic cell”, or “PV panel” are used interchangeably when solar power is being discussed or described. They shouldn’t be. 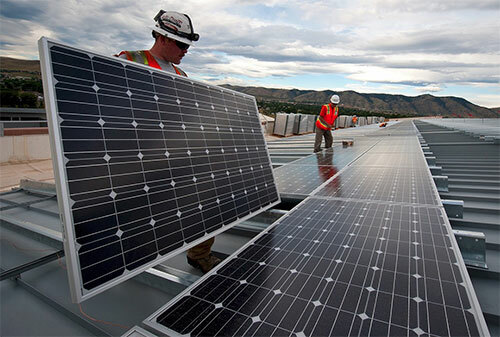 It gets confusing because both technologies use solar panels and solar arrays. The difference lies in the type of solar panel technology. Typically when people talk about solar cells, panels, or arrays they’re visualizing the panels they’ve seen on rooftops or out in fields. This is photovoltaic solar power generation, which is the solar technology that’s explained in STIKopedia and used in all Solar Stik Systems. Solar PV panels generate power anytime there is daylight—even on cloudy days—but to operate at rated capacity, they must be placed in direct sunlight, allowing photons to pass directly into the cells. Sunlight is “direct” when it is within a 15-degree angle (in any direction) of being perpendicular to the solar panel. This translates to about a 30-degree angle “window” where the panel will operate at maximum output. 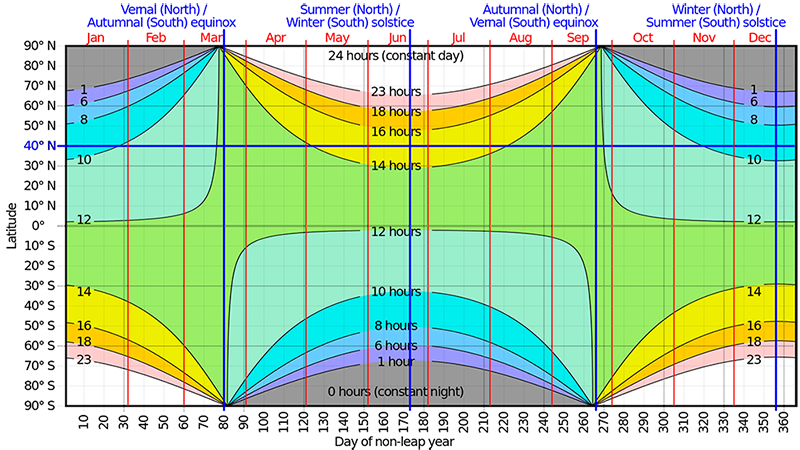 This chart illustrates the sunlight one can expect during any time of the year at any latitude and in either hemisphere. The horizontal blue line highlights the seasonal variation of the hours of sunlight at 40º N latitude. This parallel crosses through or near to Chicago, Istanbul, Beijing, and Madrid. Sunlight hitting a solar PV panel directly is absorbed most efficiently. If sunlight hits panel at an angle, the photons will be reflected more and absorbed less. Only absorbed photons can be converted into electricity. The amount of photons passing through a solar panel corresponds directly to its output current, and how this happens is explained by the elemental substances contained in a solar PV cell. Solar cells consist of four main substances: silicon, phosphorus, boron, and copper. Each substance serves a purpose in the operation of converting sunlight to electrical energy. Silicon is essential to the function of solar cells because it is a semiconductor. The octet rule states that for an atom to become stable it must react or combine with other atoms to achieve a stable outer shell configuration of eight electrons. Because silicon has four valence electrons, it can share its electrons with other silicon atoms to form a solid crystalline structure. However, this characteristic of silicon means that no electrons are free to move, rendering silicon a poor conductor. This is why phosphorus is added to a piece of the silicon in a solar cell in a process known as doping. Because phosphorus has five valence electrons, four of those electrons are shared with four silicon electrons, but there is still one phosphorus electron free to move around so electrons can flow and electricity conducts better. The resulting silicon from this addition of phosphorus is known as N-type (negative type) silicon due to the prevalence of free electrons. The other piece of the silicon is doped with boron because it has only three valence electrons (one less than silicon). This means that when a silicon atom and a boron atom share electrons, they will each have seven valence electrons, creating a gap for an electron to fill. The resulting silicon from this addition of boron is known as P-type (positive type) silicon due to the space available for electrons to fill. However, if a solar cell is to produce electricity, there has to be an electric field to move the electrons; this is achieved by placing the P-type and N-type silicon pieces in contact with each other. When this is done, some of the loose electrons on the side of the N-type silicon in contact with the P-type silicon flow and fill some of the gaps available at the edge of the P-type silicon. This forms a barrier that makes it harder and harder for the electrons to flow from the N-type to the P-type silicon, and eventually equilibrium is reached between free electrons and electron gaps, resulting in what is known as the PN-junction. Because the barrier offers too much resistance for all the electrons to cross, an electric field between the two silicon types is created. When the N-type silicon exposed to a source of light absorbs light in the form of photons, the silicon atom absorbs the quantum of energy and releases an electron. Because the electric field causing the electrons to want to travel from the N-type silicon to the P-type silicon is blocked by the electron barrier, copper wires are run through the solar cell so the electric field is channeled throughout them, causing loose electrons to be drawn through the wire. The flow of electrons produces electricity, and the copper wires become the negative and positive terminals of the solar cell. When the electrons are released by light energy, they flow through the wire and to the P-type silicon, doing work on the way. Eventually enough electrons accumulate in the P-type silicon to disrupt the equilibrium. This causes some of the electrons at the PN-junction to flow through to the N-type silicon and some of the free electrons in the P-type silicon to re-form the barrier, so the equilibrium at the barrier is constantly maintained as the electrons flow. 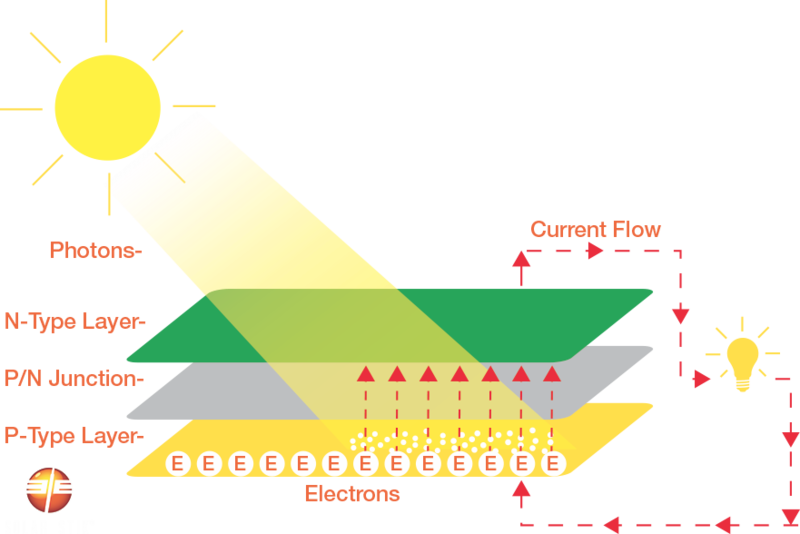 The current output of the solar cell depends on the flow of electrons, and the voltage is determined by the intensity of the electric field. Temperature plays a key role in a solar PV panel’s ability to produce power. Remember this rule when using solar PV panels: Cooler panels generate more electrical power than hot panels. As a panel becomes hotter, its efficiency is degraded. When solar PV panels are exposed to the sun’s rays, they will always experience a rise in temperature to a point known as the panel’s “operating temperature”. 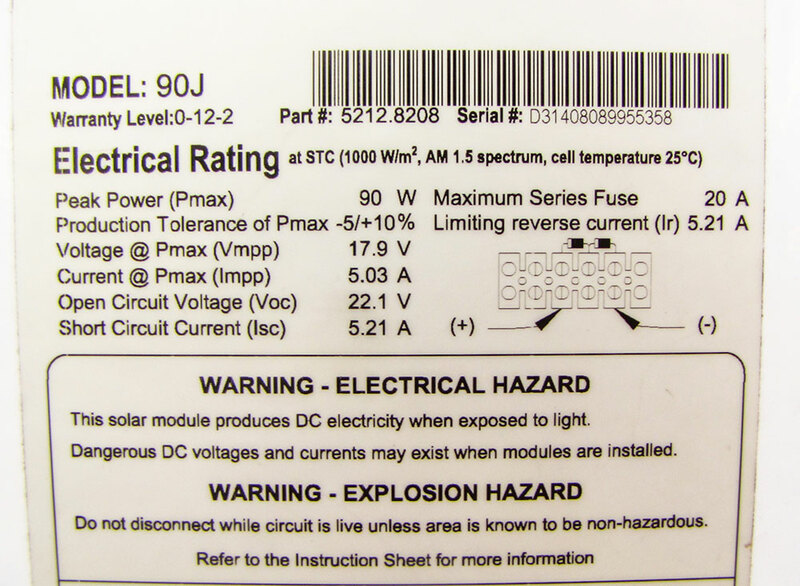 Panels are rated for a specific amount of power generation in relation to this temperature. Two factors that affect heat degradation are solar panel (PV module) construction and mounting of the solar PV panel. Photovoltaic cells (the part of the panel that produces electricity) are encapsulated using multiple layers of materials, which have the potential to alter the heat flow into and out of the PV module. The internal operating temperature of the the PV module is influenced by the amount and type of materials used in the construction and, in some cases, has a major impact on the PV module by reducing its voltage, thereby lowering the output power. Panel arrays that track the sun automatically or manually, using multiple axes of movement, allow panels to work at 100% of rated output in direct sunlight for a longer period during the day. These arrays generate higher power output for longer times than fixed-angle or single-pitch systems and can adapt to seasonal changes of the sun’s path (declination) across the sky and the daily East-West travel of the sun. The sun rarely passes directly overhead during the course of a year. 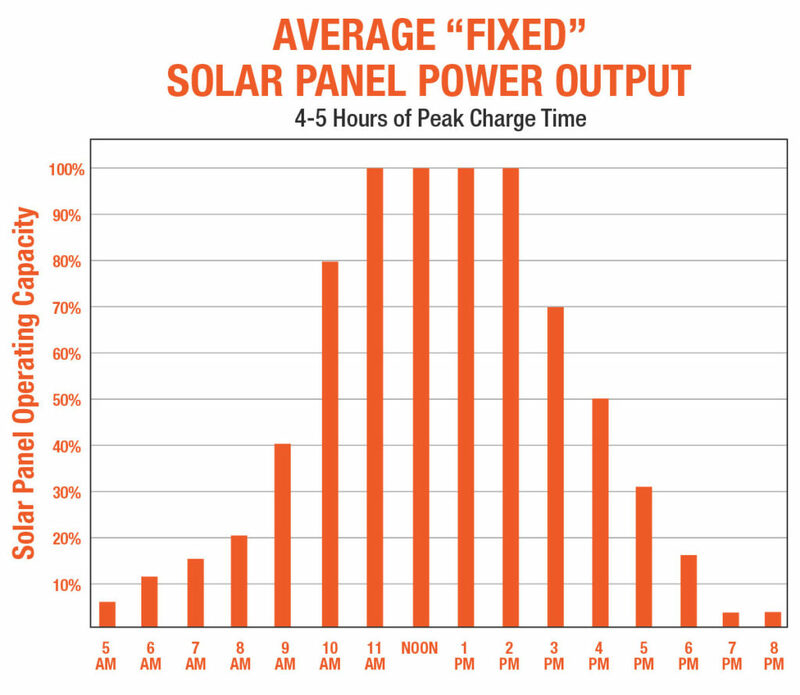 Most solar panels mounted in fixed-angle or flat positions (facing straight up) operate at reduced capacity, even during the noon hour. 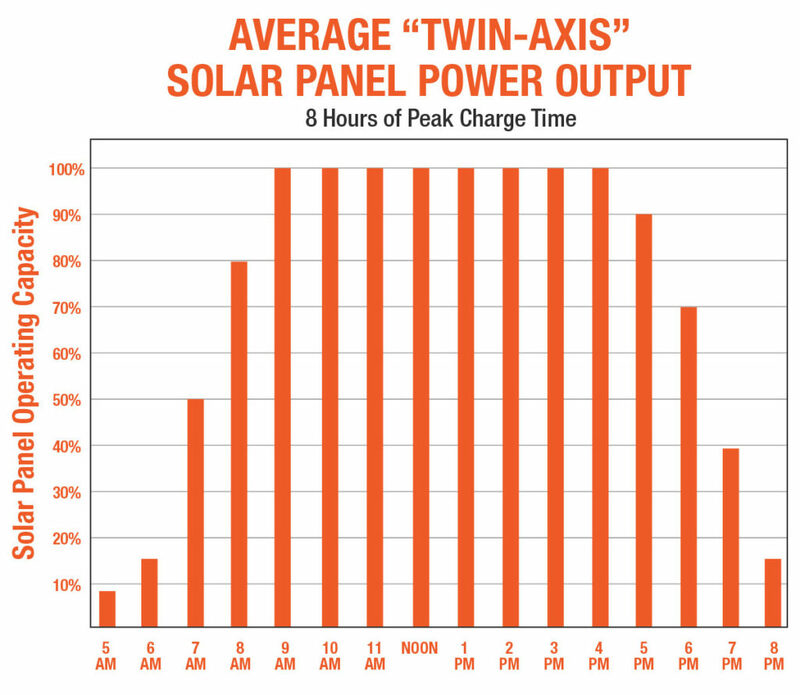 Single-axis solar PV panels often are adjusted only for seasonal changes in the angle of the sun (horizontal axis), but have limited ability to track the daily East-West progression of the sun’s travels. Single-axis tracking is extremely important for arrays that are located in far northern or southern latitudes. A solar PV array that has a multi-axis tracking system often is as effective as a fixed-mounted panel system two to three times its size. Tracking requires as few as three daily panel adjustments to produce 100% of their rated power output all day long. With tracking, users can achieve 200% to 300% increases in power output over stationary or single-axis systems, depending on geographic location and time of year. The method of mounting a solar PV panel plays a significant role in the panel’s ability to dissipate heat through one of three mechanisms: conduction, convection, and radiation. These heat-loss mechanisms depend on the thermal resistance of the module materials, the emission properties of the PV module, and the ambient conditions (particularly wind speed) in which the module is mounted. Mounting the panel away from other hot surfaces (such as a roof) will also aid significantly in cooling the panel. 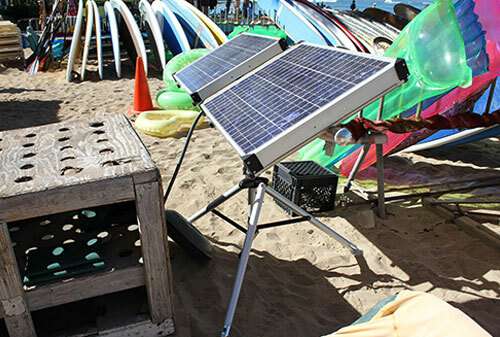 The Solar Stik design features a mechanical arm that allows panel adjustment to maximize solar exposure. 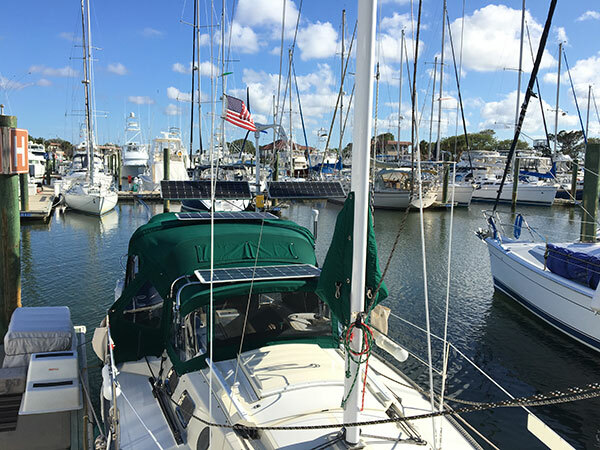 A Solar Stik also suspends the panels, allowing good air circulation that keeps the panels cooler and operating at maximum power output. The following graphs demonstrate the differences in power production between a flat or fixed solar PV array and one that is adjustable on two axes of rotation. Operators using thin-film solar PV panels laying on the ground should expect a 40% loss of the array’s rated power output. The easiest way to combat these issues is to deploy extra panels or to raise them slightly off the ground to allow for better airflow and angle to the sun. 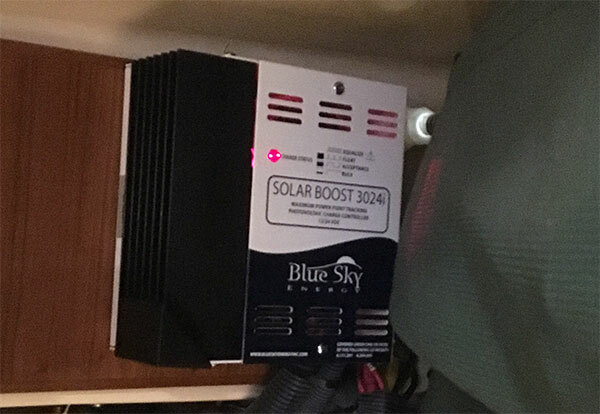 A charge controller should always be used between a solar PV panel—or array—and a battery to ensure that a safe charging voltage is applied to the battery. Maximum Power Point Tracking (MPPT) charge controllers serve both the solar PV panel and the battery by algorithmically maximizing the output of the panel and acting as a buffer between panel and the battery. The name “Maximum Power Point Tracking” can be confusing to users at first encounter because the word “tracking” implies the device tracks the sun. This is not the case; an MPPT solar charge controller is an electronic device. The MPPT charge controller is “smart” and recognizes the solar PV panel and the battery as individual circuits with completely different characteristics. When MPPT controllers are used in a solar PV system, they allow panels to operate at their rated voltage instead of the battery’s voltage, resulting in about a 25% increase in power to the battery bank when compared to using less efficient charge controllers such as series or shunt-type charge controllers. Connecting any solar PV panel (regardless of type: rigid or flexible) directly to a battery is NOT advisable, as it risks permanently damaging the battery. Charging voltage must also be limited to prevent a battery from overcharging or overheating. Use only the same PV panel types when building an array—especially if using MPPT charge controllers. Different PV panel technologies often operate at different voltages, so using mismatched panels cancels out the benefit of an MPPT charge controller and makes maximum power production unachievable. For instance, a flexible amorphous silicon panel should not be connected to a circuit that uses rigid monocrystalline panels. While this connection will not result in damage, it will significantly decrease the total power output of the panel array. 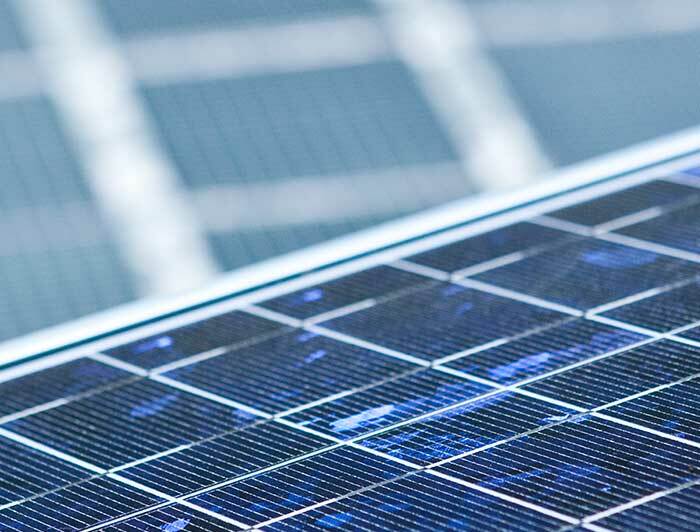 When using thin-film PV panels, it may be possible to daisy-chain connectors to add thin-film PV panels to an array, allowing operators to scale their systems to meet their power requirements. Connecting additional panels does not always provide an increase in power because the small wiring in the construction of many thin-film PV panels limits the amount of power they can safely conduct. Consult the panel’s literature for information about adding panels. How MPPT and other solar charge controllers work is explained in detail, with examples, in the Power Management module. There are many different types of solar PV panels on the market, and for every panel type there are even more manufacturers. The chemistry, construction, and performance vary greatly between panels. For years, companies have sought ways to reduce manufacturing costs associated with traditional PV technologies. This search has resulted in several types of technologies over the course of the industry’s evolution. The two most common types of solar panel technologies are rigid (mono- or polycrystalline) and flexible (thin film) . Rigid solar PV panels are ideal for stationary applications that require maximum power and a small installation footprint. They are the first generation of solar PV panels, provide more power per square foot than other PV panel types, and are highly durable. Rigid panels do not degrade significantly over time, making them a good choice for long-term investment. 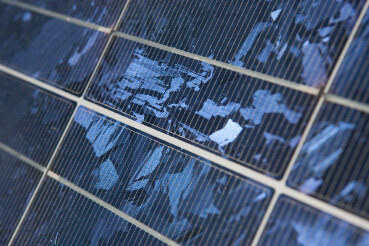 Solar Stik uses both multi- and monocrystalline, glass and non-glass—impact-resistant and shatterproof—rigid panels. Rigid solar PV panels are typically made of glass or non-glass panels and aluminum frames. Rigid panels are among the best performing panels, but their physical characteristics make them a poor choice for certain applications—especially when portable power is desired. Travel and storage can be difficult because rigid panels often contain breakable glass and cannot be folded. 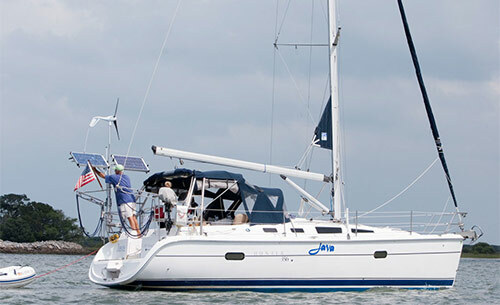 The Solar Stik system design overcomes many of the physical challenges associated with the rigid panels. 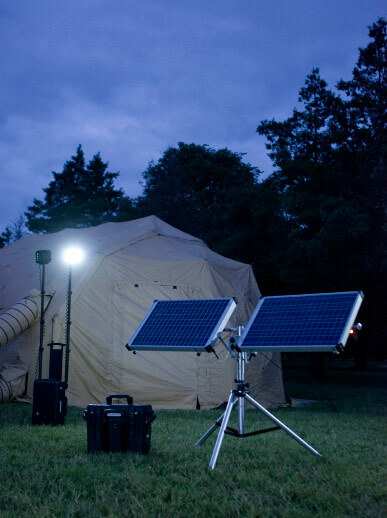 This results in portable power systems that draw from the best available PV technology. The two main types of rigid solar PV panels are monocrystalline and multi- or polycrystalline. 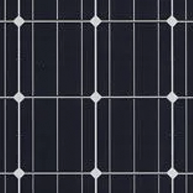 A rigid monocrystalline solar PV panel is distinctly recognizable by the arrangement of the individual solar PV cells (squares with no corners) that appears as a uniform, flat color. 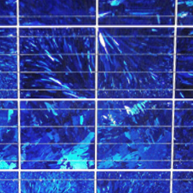 The surface of a rigid multi- or polycrystalline solar PV panel has the appearance of a rectangular grid and more of a bluish speckled color. Performance differences between rigid solar PV panels can be experienced in high operating temperatures and shaded conditions. Monocrystalline panels perform better in higher external temperatures and full sun. Multi- or polycrystalline panels suffer performance losses in higher heats but have slightly higher outputs compared to monocrystalline panels when the panel is partially shaded. Flexible solar PV panels fuse form factor with capability and deliver maximum power generation with minimum weight. Flexible panels use amorphous silicon or copper indium gallium selenide (CIGS) thin-film technology, which can be used with many substrate options that allow flexible panels to be folded or rolled. 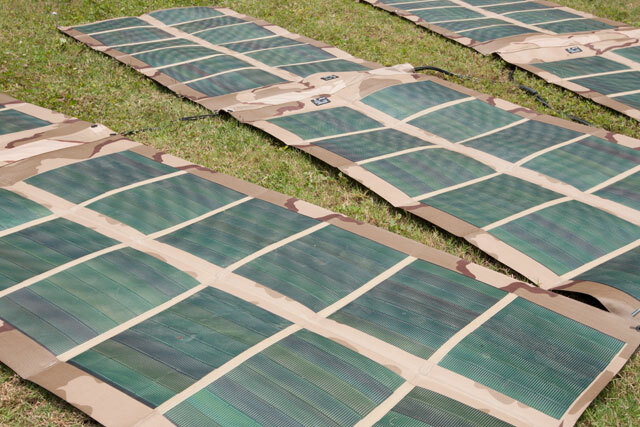 Solar Stik uses extremely rugged, paper-thin, flexible PV panels that can withstand harsh conditions. As the name implies, thin-film solar PV cells lack the thickness of other PV technologies. Composed of a very thin layer of substance on a substrate, today’s thin-film cells are one percent as thick as the first manufactured silicon solar cells. Foldable or rollable thin-film panels make storage and transport convenient. 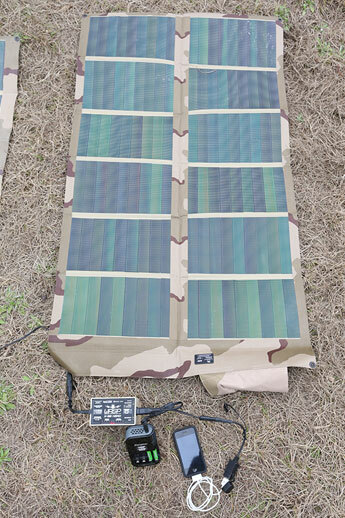 For low-power applications that require portability, thin-film solar PV panels are an excellent option. Numerous thin-film solar PV technologies exist today. However, they are slightly less efficient than other types of PV cells, so more surface area is required to generate the same amount of power. Most thin-film panels are designed for single-device applications, like recharging a battery-operated device. The two most common types of thin-film solar PV panels are amorphous silicon and copper indium gallium selenide (CIGS). Amorphous silicon is the oldest thin-film technology and arguably the best. When laid on a substrate, amorphous silicon does not require a grid configuration to conduct electricity, allowing it to be used on large areas with ease. However, it does not conduct as well as crystalline silicon solar PV cells used in rigid panel technology because the connections between the silicon atoms are not as consistent. This inconsistency results in interrupted electron flow. Numerous substrate materials can be used with amorphous silicon, making the technology highly adaptable. Polymer plastic is one option for substrate. Because polymer plastic is flexible and able to be folded or rolled, it excels in applications requiring ease of storage or transport. Amorphous silicon solar PV panels perform better in low light intensities. This makes amorphous silicon a good choice for environments with interrupted sunlight or dusty conditions. Copper, indium, gallium, and selenide comprise the photoelectric layer of a CIGS solar cell. The principles behind the operation of CIGS PV cells are the same as those for silicon cells, like those used in mono- and polycrystalline solar PV panels. With CIGS cells, copper acts to receive electrons in a fashion similar to the positive layer (P-type silicon) of a silicon cell. Selenium provides extra electrons to act in the same way as the negative silicon layer (N-type silicon). These materials can be placed onto a variety of substrates, including thin flexible steel, glass, and polymers. Flexible steel is the most widely used because of its resistance to the high temperatures needed to lay the PV elements on the backing sheet. CIGS panels have a higher-rated output per square foot of surface area than amorphous silicon panels, which allows for relatively smaller CIGS panel sizes to achieve an equal amount of power. 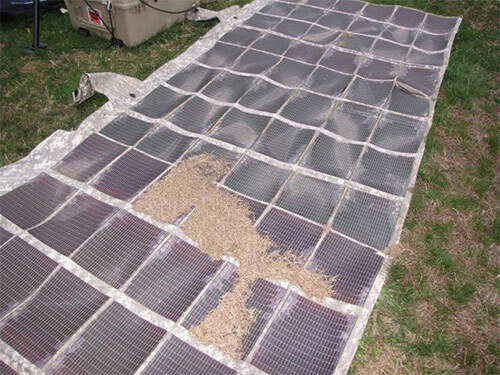 However, CIGS panels occasionally require direct exposure to sunlight—a process known as “light soaking”—before they can be used after being stored in dark, hot conditions. To make an apples-to-apples comparison between the types of panels, standard test conditions (STC) have been defined. STC uses the same conditions for all panels: direct, incident sunlight at an intensity of 1000 watts per square meter (W/m²); a cell temperature of 25 °C (77 °F); and an air mass of 1.5 (air mass, or density, affects the amount of sunlight that reaches the Earth’s surface). The operating temperature of a module is determined by the equilibrium between the heat produced in the PV module, the ambient operating temperature, and the ability of the panel to dissipate heat through its encapsulant materials. As temperatures increase, stresses associated with thermal expansion also increase, thereby increasing the degradation rates of the PV module by a factor of about two for each 10 °C increase in temperature over its STC ratings. Why does this matter? Proper panel mounting is very important! The hotter a solar PV panel gets, the more negatively its output power is affected. Each module is rated by its DC output power under standard test conditions (STC) by the manufacturer. Applications needing more power generation should consider using a high-efficiency, hybrid system. Solar panels generate power anytime there is daylight, even on a cloudy day, making them a guaranteed power source. This makes them 100% effective, but not 100% efficient. The efficiency of solar panels is measured by how much solar irradiance a panel is able to convert to electricity. Single-junction solar cells are the most common solar cells. They typically convert anywhere from 10 to 20% of the sunlight received into electricity. By comparison, a record for solar cell efficiency of ~46%—using a four-junction concentrator-type cell—has been established by the National Renewable Energy Laboratory (NREL). It will be some time before this type of multi-junction solar cell technology is readily available. Rigid monocrystalline is the first generation of solar PV panel technologies and is still the most efficient, setting the standard for other PV technologies; however, advancements in manufacturing technology have increased the efficiency of the multi- or polycrystalline panels to almost that of monocrystalline panels. While they are similar with efficiencies of 15 to 20%, monocrystalline panels are slightly more efficient in full sun, while multi- or polycrystalline panels deliver slightly higher output during periods of partial shade. Flexible solar panels are less efficient than their rigid cousins. Amorphous silicon cells can achieve an initial efficiency of 10%. Copper, indium, gallium, selenide (CIGS) cells with steel backing offer efficiency of up to 15%. CIGS panels are more efficient than amorphous silicon, but fare worse in low-light situations. Not all solar panel types are suitable for every application. Rigid panels aren’t ideal for expeditionary applications. Flexible panels sustain damage when deployed in wet environments and water is allowed to pool on the cells. Purchasing solar PV panels is the only direct cost associated with using them. 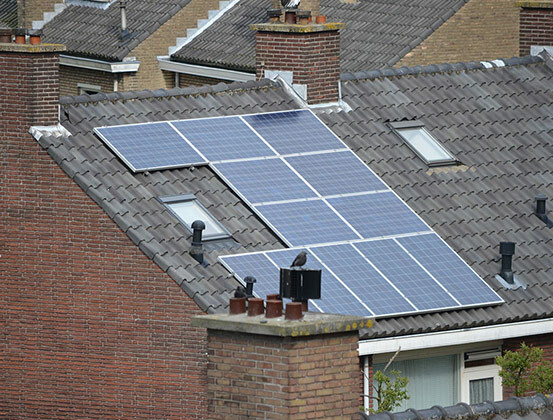 Once you own them, the panels produce power for their rated life expectancy for free as long as there is sunlight. 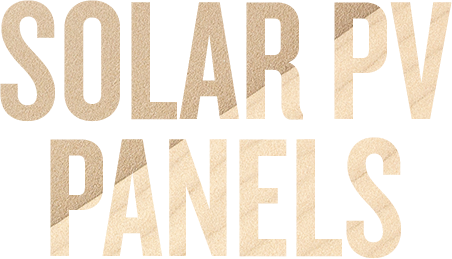 Invest in a panel that suits the intended application to withstand operating environmental challenges such as heat, inclement weather, and rough physical treatment. When choosing or replacing a solar PV panel or array, the cost varies according to the type of panel. Rigid, silicon-based crystalline solar PV panels are widely considered to be the best technology available. However, this high quality corresponds with a higher price, making these panels the most expensive on the market. Thin-film solar PV cells are less expensive to produce than silicon cells because they require fewer materials for construction. Because it takes very little material to make thin-film cells, this technology generates a lot of interest within the solar power industry. Much like their rigid-panel cousins, thin-film PV technologies can produce power for many years. The lifespan of thin-film solar PV panels is limited by their physical construction. Many materials used in these panels, such as plastics and fabric, degrade with use and exposure to the elements. In severe environments, a CIGS panel with a heavy-duty plastic or stainless-steel substrate usually lasts longer than an amorphous silicon panel of lighter-duty construction with the same power rating. Examine the physical construction of any flexible solar PV panel to ensure it suits the intended application. Thin-film panels require more care and maintenance than rigid panel technologies. When buying, beware of cheaply produced thin-film panels. The PV technology may be well-crafted, but if the construction is poor, the panel may become unusable quickly.